How Should One Approach Daily Meditation Practice? “You know you want to benefit from daily practice, but you don’t know how to go about doing it. First, you should have a proper mental attitude towards practice. Second, you should use a method. Before you practice, it is important to relax your body and mind. But be careful not to try too hard – you might become tense; or relax too much – you might fall asleep. Both extremes are wrong. That’s why a proper, balanced mental attitude is important. Tell yourself that the time you practice is the best part of the day. The little time we do spend sitting is precious. If you have this attitude, you will not feel tense or sleepy. If meditation seems burdensome, it will be hard to persist in practice. Before you sit, remind yourself to feel happy about what you’re about to do. Think of sitting as if it is your final break of the day, the time when you leave work, or are about to go out for the evening. It is a time of release, relaxation, and enjoyment. There are no worries – you let everything go. Make sure your posture is correct. Once you have settled into your posture, forget about your body. Otherwise you will not be able to relax. Tell your mind to be free. Watch your mind; see where it goes, but don’t follow it. When you follow your thoughts you’re allowing them to control you. Once you realize that you have been following wandering thoughts, they depart on their own. When you follow wandering thoughts, you are restricting your awareness to a particular train of thought. If thoughts arise, then notice your breath. If your breath is long and smooth, then you are comfortable. If your mind is clear, just sit. Make sure that you continue to sit in the correct posture. Close your eyes, lean back in your chair, and relax your muscles. Completely relax your eyes. It is very important that your eyelids be relaxed. There should be no tension around your eyeballs. Do not apply any force or tension anywhere. Relax your facial muscles, shoulders, and arms. Relax your abdomen and put your hands in your lap. If you feel the weight of your body, bring that sensation down to your seat. Do not think of anything. If thoughts come, recognize them for what they are and bring your attention to the inhaling and exhaling of your breath through your nostrils. Ignore everything. Just concentrate on your practice. Forget about your body and relax. Do not entertain doubts about whether what you are doing is useful. The principles of this method are to relax, to be natural, and to be clear. Keep each session short, but practice frequently; each session should be no longer than three to ten minutes. If you do it longer, you will probably feel restless or fall asleep. You can use this method a few times a day; it will refresh your body and mind and eliminate some of the confusion in your daily life. Gradually you will gain the stability of body and mind that makes it possible to, eventually, enter the gate of Chan. If sitting on the floor, sit on a round meditation cushion or an improvised cushion, several inches thick. This is partly for comfort, but also because it is easier to maintain an erect spine if the buttocks are slightly raised. Place a larger, square mat underneath the cushion. Sit with the buttocks towards the front half of the cushion, the knees resting on the mat. If physical problems prevent sitting on a cushion, then sit on a chair. 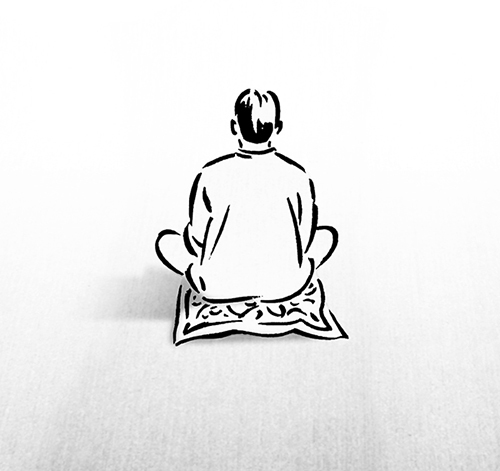 In sitting meditation, one should observe the seven points of the correct sitting posture. Each of these criteria has been used unchanged since ancient days. The purpose of these postures below is to stabilize the body so one can focus the mind. 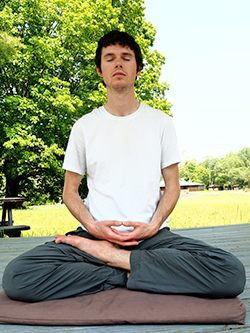 Sit on the floor with legs folded either in the full lotus or half lotus position. To make the full lotus, put the right foot on the left thigh, then put the left foot crossed over the right leg onto the right thigh. To reverse the direction of the feet is also acceptable. The half lotus position requires that one foot be crossed over onto the thigh of the other. The other foot will be placed underneath the raised leg. The full or half lotus are the traditional seated meditation postures according to the seven-point method. However, we will describe some alternative postures since people may not always be able to sit in the full or half lotus. There is a position called the Burmese posture, in which the legs are crossed and both feet rest flat on the floor, one leg in front of the other. Another position consists in kneeling. In this position, kneel with the legs together. The upper part of the body can be erect from knee to head, or the buttocks can be resting on the heels. 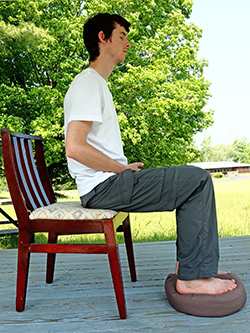 If physical problems prevent sitting in any of the above positions, then sitting on a chair is also possible, but as a last resort to the above postures. Even sitting on a chair, the spine must be erect and the body comfortable. When you begin practicing, choose a posture that will be comfortable and stable for twenty minutes. The spine must be upright. This does not mean to thrust your chest forward, but rather to make sure that your lower back is erect, not slumped, and that your chin is tucked in. Both of these points help you to maintain a naturally upright spine. An upright spine also means a vertical spine, leaning neither forward nor backward, right or left. In seated meditation, our hands form a posture called “Dharma Realm Samadhi Mudra,” which translates as: the posture or gesture (mudra) of oneness (samadhi) with reality (Dharma realm). This hand posture helps the smooth circulation of internal energies and helps harmonize the body with the external world. The open right palm is underneath, and the open left palm rests in the right palm. The thumbs lightly touch to form a closed circle or oval. The hands are placed in front of the abdomen, and rest on the legs. Relax the shoulders. Be natural. And let your arms hand loose. If you feel any tension in these areas, just relax them. The tip of the tongue should be lightly touching the roof of the mouth just behind the front teeth. This prevents your mouth from being dry. If you have too much saliva, you can let go of this connection. If you have no saliva at all, you can apply a little bit of pressure with the tip of the tongue to the roof of the mouth. The mouth should be closed. Breath through the nose, not through the mouth. The eyes should be slightly open and gazing downward at a forty-five degree angle. Rest the eyes in that direction, but do not look at anything. Closing the eyes may cause drowsiness, or visual illusions. However, if your eyes feel very tired you can close them for a short while. Walking meditation is especially useful for a change of pace when engaged in prolonged sitting, such as on personal or group retreats. Periods of walking can be taken between sittings. In slow walking, the upper body should be in the same posture as in sitting, the difference being in the position of the hands. The left palm should lightly enclose the right hand, which is a loosely formed fist. The hands should be held in front of, but not touching, the abdomen. The forearms should be parallel to the ground. The attention should be on bottom of the feet as you walk very slowly, the steps being short, about the length of one’s foot. If walking in an enclosed space, walk in a clockwise direction. Fast walking is done by walking rapidly without actually running. The main difference in posture from slow walking is that the arms are now dropped to the sides, swinging forwards and backwards, as in natural walking. Take short fast steps, keeping the attention on the feet. Breathe naturally, do not try to control your breathing. The breath is used as a way to focus, to concentrate the mind. In other words, we bring the two things together – regulating the breathing and regulating the mind. Regulating the mind means to stabilize and concentrate the mind. The basic method of regulating the mind is to count one’s breath in a repeating cycle of ten breaths. Starting with one, mentally (not vocally) count each exhalation until you reach ten, keeping the attention on the counting. After reaching ten, start the cycle over again, starting with one. Do not count during the inhalation, but just keep the mind on the intake of air through the nose. If wandering thoughts occur while counting, just ignore them and continue counting. If wandering thoughts cause you to lose count, or go beyond ten, as soon as you become aware of it, start all over again at one. If you have so many wandering thoughts that keeping count is difficult or impossible, you can vary the method, such as counting backwards from ten to one, or counting by twos from two to twenty. By giving yourself the additional effort, you can increase your concentration on the method, and reduce wandering thoughts. If your wandering thoughts are minimal, and you can maintain the count without losing it, you can drop counting and just observe your breath going in and out. Keep your intention at the tip of your nose. If, without any conscious effort, your breathing naturally descends to the lower abdomen, allow your attention to follow your breathing there. Do not try to control the tempo of your breathing, just watch and follow it naturally. A less strenuous method, also conducive to a peaceful mind, is to just keep your attention on the breath going in and out of your nostrils. Again, ignore wandering thoughts. When you become aware that you have been interrupted by thoughts, just return to the method. Although the methods of meditation given above are simple and straightforward, it is best to practice them under the guidance of a teacher. Without a teacher, a meditator will not be able to correct beginner’s mistakes, which if uncorrected, could lead to problems or lack of useful results. In practicing meditation, it is important that body and mind be relaxed. If one is physically or mentally tense, trying to meditate can be counter-productive. Sometimes certain feelings or phenomena arise while meditating. If you are relaxed, you will not be affected by whatever arises. It can be pain, soreness, itchiness, warmth or coolness; these are all natural reactions from meditation. But in the context of tenseness, these same symptoms may become obstacles. For beginners, if the mind is burdened with outside concerns, it may be better to relieve some of these burdens before sitting. For this reason, it is best to sit early in the morning, before dealing with the problems of the day. Sitting times may be increased with experience. But people who meditate for extended periods may become so engrossed in their effort that they may not recognize their tensions, because their minds are preoccupied with getting results. So to work hard on meditation means to just put your mind on meditation itself, not on any results. If you can do that, tension will not arise. On the contrary, deeper relaxation, and calming of the body and mind should result.